Returns the estimated bounding box considering the changes of the particle system (velocity, length, etc.). Enables or disables re-initialization of the particle system each time it is enabled. Returns a value indicating if particle system is to be re-initialized each time it is enabled. Enables or disables detecting collision by the outer surface of the sphere that approximates the particles (each particle is approximated with the sphere). Returns a value indicating if collision is detected by the outer surface of the sphere that approximates the particles. Sets restitution of the deflector. Returns the current restitution of the deflector. Sets roughness of the deflector surface. Returns the current roughness of the deflector. Sets a transformation matrix for a given deflector. Returns the transformation matrix of a given deflector. 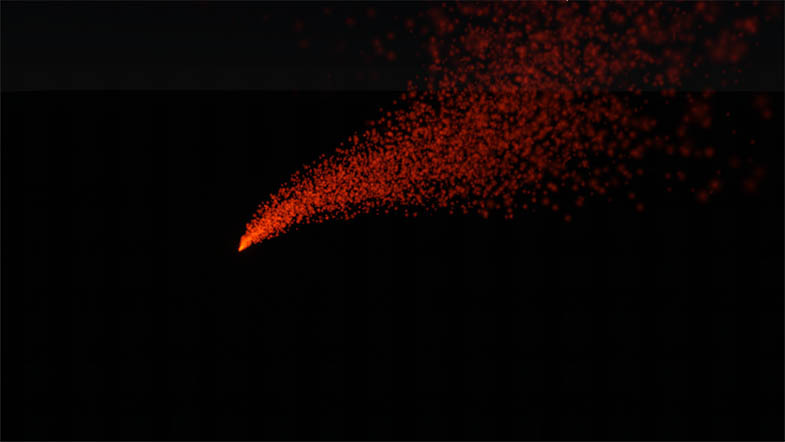 Enables or disables depth sorting of particles. Returns a value indicating if depth sorting of particles is enabled. Sets a value indicating if the emitter spawns particles only when it is moving. Returns a value indicating if the emitter spawns particles only when it is moving. Sets an emitter velocity, which is added to the initial velocity of spawned particles. Returns the current emitter velocity, which is added to the initial velocity of spawned particles. Enables or disables detecting collision by the center of the sphere that approximates the particles. Returns a value indicating if collision is detected by the center of the sphere that approximates the particles. Sets a bit mask for interactions with physicals. Returns the bit mask for interactions with physicals. Sets the mass of the particles. Returns the current mass of the particles. Enables particle system rendering to procedural texture to be used by an orthographic decal or a field height. Sets the type of relationship between the particle system and a decal / field node that uses the procedural texture. Returns the current type of relationship between the particle system and a decal / field node that uses the procedural texture. Sets positioning mode to be used for child nodes using the procedural texture to which the particle system is rendered. Returns the current number of particles to be spawned simultaneously each time according to the spawn rate. Sets the velocity threshold for spark and random emitters. Returns the current velocity threshold for spark and random emitters. Enables the warm start for the particles. Returns a value indicating if the warm start is enabled for the particles. Returns the estimated world bounding box considering the changes of the particle system (velocity, length, etc.). Returns the current world offset of the local origin of coordinates of the particle system. Restores the object's state from the stream. Saves the object's state to the stream. Saves the state of the object's forces to the specified stream. Restores the state of the object's forces from the specified stream. Saves the state of the object's noises to the specified stream. Restores the state of the object's noises from the specified stream. Saves the state of the object's deflectors to the specified stream. Restores the state of the object's deflectors from the specified stream. TYPE_ROUTE Particles of this type can be used to create tracks from moving objects (for example, foam after a ship). Each Route particle is flat (just like flat particles), but is oriented on the plane in the same way as the emitter when it spawned it. int enable - 1 to re-initialize particle system each time it is enabled; otherwise, 0. 1 if particle system is to be re-initialized each time it is enabled; otherwise, 0.
int deflectors - Number of deflectors. Enables particle system rendering to procedural texture to be used by an orthographic decal or a field height. For example, ship wake waves are simulated using this feature. Returns the value indicating if the procedural rendering enabled or not. This feature enables rendering of particles into an orthographic decal or a field height, and can be used, for example, to create ship wake waves. Procedural rendering must be enabled. 0 - a decal/field node that uses the procedural texture is a child of the particle system. 1 - a decal/field node that uses the procedural texture is a parent of the particle system. PROCEDURAL_POSITIONING_MANUAL = 0 - position of a child decal/field node, that uses the procedural texture, can be changed manually. PROCEDURAL_POSITIONING_AUTO = 1 - position of a child decal/field node, that uses the procedural texture, is automatically defined by the position of particle system and cannot be changed manually. int spawn - Number of particles to be spawned simultaneously. Current number of particles to be spawned simultaneously. This method restores all object's parameters, including forces, noises, and deflectors. To restore any of these parameters individually, use restoreStateForces(), restoreStateNoises(), or restoreStateDeflectors() respectively. This method saves all object's parameters, including forces, noises, and deflectors. To save any of these parameters individually, use saveStateForces(), saveStateNoises(), or saveStateDeflectors() respectively.